I can't believe that I'm actually getting to the point where I'm starting to feel sorry for Carrie Underwood. Because I've said it before that I'm not exactly a fan of hers - she's made a few scattered songs I like, mostly telling stories where folks wind up dead, but the albums are consistently inconsistent, handicapped by frustrating production choices and Carrie Underwood having a tendency to rely more on raw power than subtlety or a genuine edge. I'm not saying she's a bad artist by any stretch - although if I never have to hear 'Before He Cheats' or 'Jesus Take The Wheel' again in my life I'd be happy - but that I've always been less enamored of her material than most. But the more I've read about the lead-up to this album, the more sympathy I feel for her. Putting aside the fall where had to get surgery, Cry Pretty marked the shift to a new label at Capitol Nashville, as well as a complete change in production team from the folks she had been working with at Arista Nashville. That's a sizable step... and yet the rollout does not seem to have been handled well, with country radio not throwing support behind a reasonably well-received title track and her label yanking promotion a few weeks before the album's release... both suspiciously timed right behind Carrie Underwood making statements criticizing the failure of country radio to play any women and instead shoveling out more interchangeable meatheads who have just as much of a pop focus - or worse still, promoting women in pop for the easy crossover while ignoring women in country or even pop country. And before you think radio executives wouldn't be that petty... well, they are, but the larger question is what this means for Carrie Underwood going into the album, because people can get sick of an artist if they don't deliver quality, and when you pair it with sloppy or sabotaged promotion, that could be a big red flag. 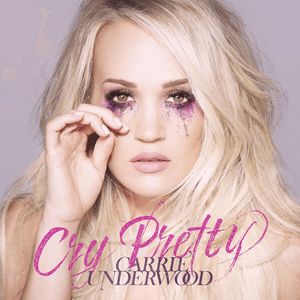 But hell, I was still curious about Cry Pretty, especially with Underwood taking a much bigger hand in the songwriting, so what did we get here? Well folks, I'll freely admit I was giving Carrie Underwood the benefit of a lot of doubt going into this album. I had the hope that maybe this album on a new label and with a different set of producers might result in a creatively galvanized artist who could buck against compromise... and that was pretty much the opposite of what I got with Cry Pretty. I said on Twitter that this is the most compromised Carrie Underwood album I've heard and I meant it, the sort of album where for the first time it sounds like it could have been cut by any up-and-coming woman in pop country, with significant steps back in songwriting and production. And I don't know where to assign blame with this, because I certainly get Capitol Nashville's reticence in promoting this... but at the same time, if this is the direction their creative team wanted to push Carrie Underwood, it was the wrong one in a big way. Well okay, maybe that's overselling things, because at the end of the day, folks want to hear Carrie Underwood sing and while her delivery remains the furthest thing from visceral for me, she still has a huge voice and there are even a few cuts where she's trying to get a little more subtle and understated like 'The Bullet' and 'Spinning Bottles'... and while I'd question how much either song quite connects, it's not because she's not trying. And on the flip side, if you give Carrie Underwood a backing choir... well, it's symphonic overkill, but she's one of the few who can sell a song like 'Love Wins', and it at least feels like a comfortable lane for her. Because on the flip side you get cuts like 'Southbound' which are borderline gender-flipped bro-country and it can't help but feel like a complete waste of her talents. Furthermore, it's an awkward fit - Carrie Underwood has never tried to carry a loose party song in her entire career, and you can tell the cadence feels off - it reminds me too much of when Jessica Simpson tried to make an R&B transition from pop belting in the early 2000s, and the pivots to more of an R&B flow on this album sadly feel just as calculated. But that could be redeemed if the production was able to support her - which is a major issue, because on significant chunks of this record, the production is beyond help. Going back to 'Love Wins', I appreciate the heavenly swell and just placing Carrie Underwood in her natural environment of American Idol power ballads, but by the time we got to a cut like 'Kingdom' that ends the album, it felt a lot closer to Christian music but with a production budget and only slightly less overt messaging, letting the pristine acoustic guitars and pedal steel fill up the mix and at least show some residual connection to country. And really, you need to hold onto those atmospheric pedal steel touches and acoustic guitar, because on a fair few of the outright pop cuts like 'Backsliding' or 'The Song That We Used To Make Love To' and 'End Up With You', they're about the only things that connect the sound to something grounded and distinctive and not a by-the-numbers hazy mainstream pop tune, complete with snaps, clunky percussion on the cusp of trap, and really awkward vocal overdubs. The last one becomes a significant issue even on songs that have more potential like 'Drinking Alone', which had the potential for some decent smoky simmer off the bass and wispy guitars, but those added 'ooh ooh oohs' ironically kill any sense of atmosphere. Maybe they could have worked if they didn't feel so breathy and plastic and thin, but that's generally my complaint with the production as a whole - if you were expecting any firepower out of the instrumentation reminiscent of Blown Away or even Storyteller, that edge and texture is completely gone, which leaves us with tunes that feel increasingly indistinct. Hell, when it does come back for cuts like 'Low' that are trying to amp up some soul, there isn't much warmth or intensity to the guitar layering, and on the flipside you get a song like 'End Up With You', which has a really catchy groove but features about some of the worst vocal production I've heard on a Carrie Underwood record, period! But this is where we have to slip towards content and lyrics, where I've been on the record as being underwhelmed by Carrie Underwood before but where she and her team have been willing to take conceptual risks and write some pretty dark material... and while I won't say this record completely departs from that space, I will say it's more than a little jarring to see someone who made 'Before He Cheats' and so many murder ballads put out a song like 'The Bullet', which is a decently written and well-produced track about a victim of gun violence but feels increasingly shaky and disingenuous, especially in the context of Carrie Underwood's career and even moreso with how it wants to touch on the issue but avoids assigning any blame or actually talking about it. Hell, when this album isn't wallowing in a pile-up of underwhelming breakup songs, the positive affirmation of how we can all come together from both sides on 'Love Wins' and 'Kingdom' feels a little saccharine and underwhelming and with this production all the more calculated. That's the weird thing about this album - I can stomach the quasi-spiritual cuts because Carrie Underwood has been in that lane for a long time, but when you get to cuts like 'Backsliding' and 'Low' and 'That Song That We Used To Make Love To', they show a frailty that doesn't so much show added nuance but a label rebrand that's an awkward fit across the board, especially as this record doesn't get as raw as she's been in the past. There's almost a sick sort of irony to it, how the title track explicitly says how Underwood has been so good at holding herself together but when the emotions get raw it's ugly and tough... but the writing, production, and delivery across a good half of this album shows none of that! Now there are two welcome exceptions - I might not be crazy about 'Drinking Alone' in its production, but the writing at least feels a bit more sour and real. And 'Spinning Bottles' is a solid, restrained stab at the breakdown of an alcoholic relationship that I'd probably like more if Lauren Alaina didn't release 'Same Day, Different Bottle' last year, which cut considerably deeper. But at the end of the day... I'm almost at a loss, folks, because the part of me that wants to root for Carrie Underwood cannot root for this album. And it's hard to escape the feeling that this is an attempted label rebrand from Capitol Nashville with even poppier production and neutering anything left of her edge to appeal to the widest audience possible. And from the muted critical reception thus far, I don't see this reflecting well going forward. it's a bad sign that while I don't cover bonus tracks, I'd probably slot her collaboration with Ludacris 'The Champion' - tacked on to boost streaming certifications - as one of the better songs here! But as it is... 5/10, only a recommendation to the diehard fans, but if you're in that camp, I guarantee you're going back to older and better Carrie Underwood records beyond this in a week - I'd put money on it.